Drafts from Around the World: May 28 2013: Dutch and Belgian influences in St Petersburg! May 28 2013: Dutch and Belgian influences in St Petersburg! The past couple of days have been a blur of getting up between 6:30-8am and going to bed around 2:30am. Olga is relentless when it comes to visiting with the most friends and family in the shortest time, and this trip is one of the shortest in St Petersburg. Some of the highlights for me include sleeping during The Mermaid opera in the beautifully modern and comfortably seated new Mariinsky-2 Theatre, falling asleep on the couch during a lull at a dinner party in the dacha near the Finnish Gulf, and passing out against a wall at Pierogie restaurant near Nevsky Prospekt. Our last day in St Petersburg before heading further east, we checked out two cafes recommended by Olga's brother Kostya, who's sort of the king of the St Petersburg cafe scene. First up was Candies by Coffee Room, where we were treated to a beer cocktail consisting made from Licorne Black темное пиво (dark beer), лайм (lime), and cranberries. I've seen beer cocktails at San Francisco beer week, but haven't tried them until now. It's a refreshing sort of sangria-like drink, like en effervescent fruity party in your mouth! Eating all the beer-soaked fruit at the end was fun too. At Small Double we had a choice of coffee made by Syphon, Chemex, or Aeropress. We took the Chemex as it's similar to the cup-at-a-time filtered 3rd wave coffee we'd grown used to in San Francisco. The syphon looked super interesting too, to try when we return to St Petersburg next week. 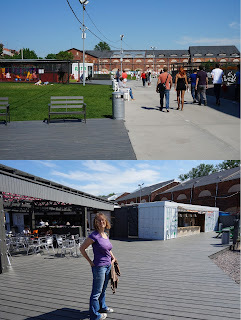 Mid-day we explored Новая Голландия (New Holland Island), which was military warehousing for 200 years, before becoming abandoned for almost 100 years, finally becoming a public park, and soon to be a mall and hotel space. Stay tuned as the old brick buildings get converted into a mall, sort of a luxury version of Arsenal Mall in Watertown MA. In the meantime we have temporary cargo containers housing bookstores, galleries, an "open library" book exchange, ping ping tables, and a biergarten. It's a lovely space! For dinner we convinced Maria and Leonid to meet us as the Belgian restaurant Cafe Trappist, with its patio, upstairs, and cute cellar. The cellar was perfect for us and, although the portions were small and pricey, food arrived much after promised, they brought some of the wrong dishes, and I might've had an allergic reaction to the mussels, still I enjoyed the place and especially their phenomenal-for-beer-naive-Russia beer menu. Hey dude! I went to find you on chat and when you weren't online I thought "I wonder where in the world Dave is off to now?" Now I know! Have fun and keep the blogs coming! Big hugs to you and Olgie! That beer cocktail sounds super interesting. I've never heard of anything like that. May 30 2013: Moscow is out of this world!